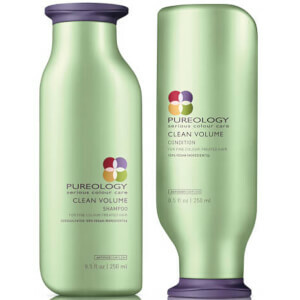 Add bounce and fullness to fine, colour-treated hair with Pureology Clean Volume Conditioner, a lightweight formula that detangles and volumises without weighing hair down. The ZEROSULFATE® formula expertly softens and smoothens tresses while promoting enviable shine, flexibility and body. It contains moisture-retaining Aloe Water, and fortifying Soy Protein to protect and strengthen every strand. It also utilises an ANTIFADE COMPLEX® to protect against colour fading. Your hair looks silky and full-bodied with prolonged color vibrancy. 100% Vegan. Free from sulphates and silicones. I loved it every second! Very soft hair and smell nice. I bought this as part of the trio in box,including shampoo and leave in style spray.I used the hydrate range previously but felt I needed a change as my hair was getting greasy at roots.I liked this product as I felt the shampoo from the same range dried my hair,although I am using more than I did with the hydrate 1.Even so my hair is no longer greasy at roots and that is what I wanted.I would recommend this product. I find that a little goes a long way with this conditioner and it doesn't clog up my hair like some other brands. This conditioner is great for my hair as it is very fine and l have been colouring it for a number of years. It makes me feel confident that my hair will feel really soft and smell gorgeous, will buy this product again!